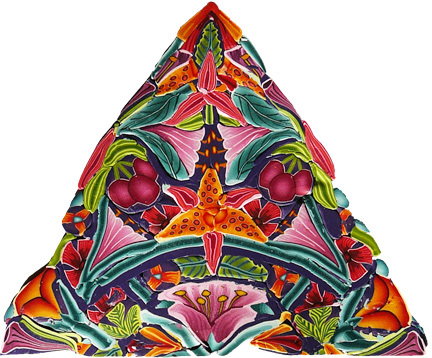 As with the Chinese embroidery, the color inspiration for the master cane was a textile; in this case this needlepoint pillow designed by Elian McCready. 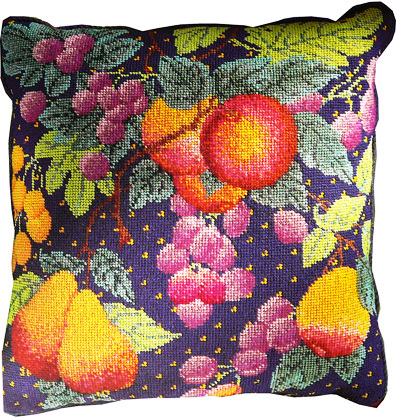 The design, called “Fruit Drops,” appears in “The Ehrman Needlepoint Book,” by Hugh Ehrman. I love looking at needlepoint books for both design ideas and color inspiration. An added benefit is that the shading of objects in needlepoint designs is simplified, which makes them readily translated into polymer clay canework. This is the master cane I created (actually, these are slices of the cane components arranged on a piece of glass to represent the cane design, which is why there are discontinuities in the design). When I translate my color inspiration into canework I often increase the range of light/dark contrast as I did here so that the design components continue to be “readable” after the cane has been reduced. 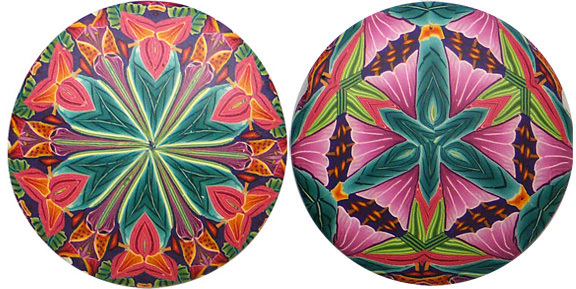 I appropriated a couple of the images in the pillow (the blue-green leaves and the cherries) for in my cane design but I switched some of the colors around. I made the cherries in my cane the color of the darkest part of the central peach on the pillow, and used the colors of the cherries on the pillow for flowers in my cane. 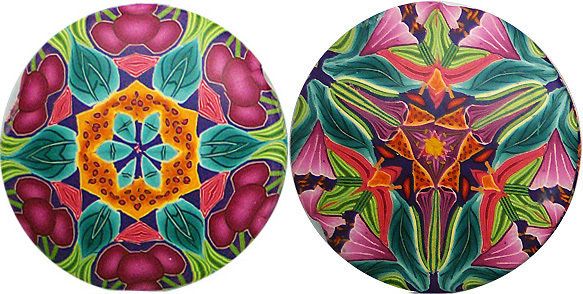 These are some of the kaleidoscope pendants I created from the master cane. 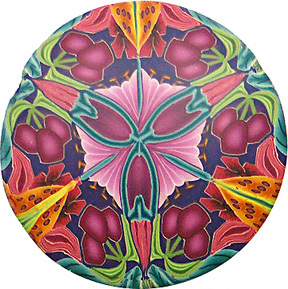 The color balance in the kaleidoscope designs differs from pendant to pendant depending upon which area of the master cane was used in the pendants. Nevertheless, they are color coordinated because they share the same overall pallet. This entry was posted in Caning, Color, Kaleidoscopes, Sources of Inspiration and tagged Carol Simmons, Color, Color Mixing, Kaleidoscope Canes, polymer clay, Polymer Clay Classes, Polymer Clay Colorado, Polymer Clay Teachers, Polymer Clay Techniques, Polymer Clay Workshops. Bookmark the permalink. The cane is marvelous. How long does it take to make one master cane? This one took about 3 days. Carol, Your canework is stunning & I love your needlework inspiration idea! They make me feel energized! I’m not sure what you mean, Jodie. I sent my message on March 12, you responded on April 12, and I then saw it on May 12!!! (interesting, huh?) Have a great day! I’m supposed to get notified when I get comments, but it doesn’t seem to happen consistently. Thank you, Lisa. What a wonderful compliment. I’m trying to be super careful with my hands. Aloha from Kauai Carol: I’m a ceramic artist infatuated with colored clay. I’ve never worked with polymer clay but I’m learning polymer techniques that I can use in ceramic pieces. I think I’m one of only a handful of ceramic artists that see the potential in doing this. I love your work! What’s the best way for me to learn from you? Unfortunately I can’t come to a workshop on the mainland. Do you have any tutorials on the internet? Or DVD’s? I don’t have any tutorials or DVDs available; only my blog. You are the second ceramicist that contacted me. I’m trying to recall who the other one was so I can put you in touch with one another. I think I’ve also seen some extruded clay designs in the Penland Book of Ceramics. I suggest you try some basic caning with polymer clay. There are lots of online tutorials on making various cane designs. Search under the topic of “caning” or “millefiori”. If you are like me, actually doing it will give you lots of ideas.